This travel-sized guide is a convenient and quick way to keep a pest management reference in your pocket. The set of 53 full-color cards contains photos and information about common insect and mite pests as well as plant diseases, nematodes, abiotic disorders, weeds, and vertebrate pests. The cards focus on sustainable pest management for vegetables, melons, fruit trees, and other crops commonly grown in small-scale farms and backyard gardens. 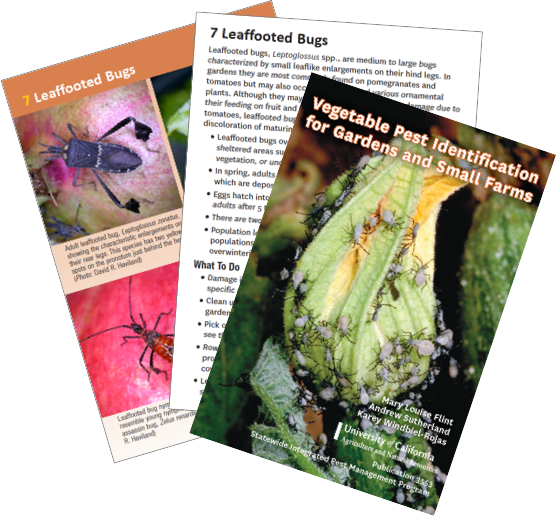 Also included is information on general predators, lady beetles, parasites, and insect pathogens to help you identify “good bugs” in the garden and farm. Vegetable Pest Identification for Gardens and Small Farms is based on the best-selling book Pests of the Garden and Small Farm. The cards were created by Mary Louise Flint, Andrew Sutherland, and Karey Windbiel-Rojas from the UC Statewide IPM Program. Order your card set today from the UC ANR Catalog online.